For the steel company headquartered in Baotou, see Baotou Steel. "Baosteel" redirects here. For the subsidiary, see Baoshan Iron and Steel Co., Ltd.
"Baoshan Iron and Steel" redirects here. For the subsidiary, see Baoshan Iron and Steel Co., Ltd.
China Baowu Steel Group Corp., Ltd., commonly referred to as Baowu Steel, is a state-owned iron and steel company headquartered in the Baosteel Tower in Pudong, Shanghai, China. Baosteel is the fifth-largest steel producer in the world measured by crude steel output, with an annual output of around 35 million tons (China's total steel production in 2015 was 803.8 million tons). It employs 130,401 employees as of the end of 2012, has annual revenues of around $21.5 billion, and produces a mix of products. According to World Steel Association (Chinese companies data was provided by China Iron and Steel Association), the corporation was ranked the 5th in 2015 the world ranking by production volume (2nd in China for 34.938 million metric tons). A plan to merge with Wuhan Iron and Steel Corporation was announced on 21–22 September 2016, which would make the combined production volume the second highest in the world (34.938 million + 25.776 million), after ArcelorMittal (97.136 million in 2015), surpassing Hesteel Group (47.745 million in 2015). Since Baosteel Group and Wuhan Iron and Steel Corporation also announced targets of cutting 3.95 and 4.42 million metric tons production capacity respectively in June and July 2016, and a further cut for Baosteel Group of 2.10 million while a 3.15 million cut was already planned the final ranking may still significantly change. The IPO of the subsidiary of Baosteel Group on the Shanghai Stock Exchange in 2000 was the largest in China up to that time, raising CNY 7.7 billion despite being limited to domestic investors only. Beginning in 1978, the Chinese government began to institute economic reforms. Plans called for a large integrated steel production facility to be located near the port of Shanghai. The Baoshan District, a suburb of Shanghai, was chosen as the site and Japanese assistance was enlisted in constructing one of the most modern steel plants of the time. As the government's flagship steel company, Baoshan Iron and Steel as it was originally called, benefitted from acquiring the engineers and managers, access to technology, and receiving government contracts. In 1997, a subsidiary of Shanghai Metallurgical Holding, the former Shanghai No.3 Iron and Steel Plant, Shanghai Pudong Iron and Steel, formed a joint venture with ThyssenKrupp of Germany, as Shanghai Krupp Stainless. It followed the parent company to become a subsidiary of Baosteel Group in 1998. In 2000, a subsidiary Baoshan Iron & Steel Co., Ltd. was formed to list a portion of the group on the Shanghai Stock Exchange, while Shanghai No.1st, 2, 3 and 5 Iron and Steel Plants of the group were remaining unlisted. In 2004, the listed subsidiary acquired Meishan Iron and Steel from Baosteel Group (via Shanghai Meishan Group). In 2007 Baosteel Group acquired the majority stake of Xinjiang Ba Yi Iron and Steel Group, which was the parent company of Ba Yi Iron and Steel [Company Limited by Shares]. In 2008 Baosteel Group expended in Southern China, which planned to build a new facility in Zhanjiang, Guangdong, which formally started by its subsidiary Baoshan Iron & Steel in 2012, by acquiring 71.8032% stake of Zhanjiang Iron and Steel for CNY4.976 billion from State-owned Assets Supervision and Administration Commission of Guangzhou City. In 2011, Boasteel Group acquired 51% stake of Guangdong Shaoguan Iron and Steel Group from SASAC of Guangdong Government. On 21–22 September 2016, a plan to merge Baosteel Group and fellow state-owned steel maker Wuhan Iron and Steel Corporation was announced. Baoshan Iron and Steel, the listed portion of Baosteel Group would takeover the counterpart Wuhan Iron and Steel Company in an all-share deal, while the rights of Wuhan Iron and Steel Corporation would be transferred to Baosteel Group for free as a wholly owned subsidiary. Both Baosteel Group and Wuhan Iron and Steel Corporation were supervised by SASAC of the Central Government. As of December 2016, the name of the new group is China Baowu Steel Group Corporation. It is now the second largest steel producer in the world, with assets estimated to be worth around 730 billion Yuan, employing 228,000 employees and expected annual sales revenues of 330 billion Yuan ($47.9 billion). In early 2016, Baosteel Group was accused by US Steel Corp. of stealing commercial secrets. Baosteel rejected these allegations, stating that "In particular, the charges claiming that Baosteel stole commercial secrets from U.S. Steel is rootless speculation and subjective assumption, and could even be described as an absurd statement". The International Trade Commission (ITC) launched a probe into these allegations in May 2016. Next to Baosteel, Hebei Iron and Steel Group, Wuhan Iron and Steel Co Ltd, Maanshan Iron and Steel Group, Anshan Iron and Steel Group and Jiangsu Shagang Group are also under investigation. Shanghai First Iron and Steel Co., Ltd.
Shanghai Second Iron and Steel Co., Ltd.
Shanghai Pudong Iron and Steel Co., Ltd.
Shanghai Fifth Iron and Steel Co., Ltd.
Baosteel Group was a minority owner of Metallurgical Corporation of China Limited for 0.65% (as at 30 June 2010). Excluding the investment held by the listed subsidiary Baoshan Iron and Steel, Baosteel Group owned 0.88% stake (via Hwabao Investment) in PetroChina Pipelines, the company that runs West–East Gas Pipeline. Baosteel Group, as at 31 December 2015, still owned 15.11% stake in New China Life Insurance, a listed company in both Hong Kong and Shanghai Stock Exchange, as well as China Bohai Bank for 11.67% stake, China Pacific Insurance for 14.17% stake. ^ "About Baosteel". Archived from the original on 2011-07-07. Retrieved 2009-12-11. ^ "Contact Us." Baosteel. Retrieved on November 10, 2012. "ADD:Baosteel Tower, Pu Dian Road 370, Pudong New District, Shanghai, 200122, P.R. China Postal Code:200122" - Chinese: "上海市浦东新区浦电路370号宝钢大厦"
^ Sirkin, Harold L.; James W. Hemerling; and Arindam K. Bhattacharya (2008-06-11). GLOBALITY: Competing with Everyone from Everywhere for Everything. Archived 2008-09-23 at the Wayback Machine New York: Business Plus, 304. ISBN 0-446-17829-2. ^ "China deal to create world's second-largest steelmaker". Financial Times. ^ "化解钢铁过剩产能公告" (in Chinese). Baosteel Group. 30 June 2016. Retrieved 4 October 2016. ^ "武汉钢铁(集团)公司关于化解过剩产能实施脱困发展的公告" (PDF). Wuhan Iron and Steel Corporation. 7 July 2016. Retrieved 3 October 2016. ^ "宝钢实施全方位结构调整和转型升级" (in Chinese). Baosteel Group. 19 August 2016. Retrieved 4 October 2016. ^ "China's Baosteel heads for stock market". BBC. 6 November 2000. Retrieved 3 October 2016. ^ "China's Top Steel Mills Step Closer to Creating Arcelor Rival". Bloomberg. 21 September 2016. Retrieved 3 October 2016. ^ "Announcement: Moody's says China Baowu Steel nears full merger with Wuhan Steel; no rating impact". Moody's. Retrieved January 25, 2017. ^ Levit, Donald (January 22, 2017). "China's Steel Reform Shifts Into Higher Gear". Economic Calendar. Retrieved January 25, 2017. ^ "China Baowu Steel Group officially established". Steel Orbis. December 5, 2016. Retrieved January 25, 2017. ^ "China's Baosteel Group says U.S. Steel accusations groundless". Reuters. April 29, 2016. Retrieved January 25, 2017. ^ "U.S. panel launches trade secret theft probe into China steel". Reuters. May 29, 2016. Retrieved January 25, 2017. ^ "2010 Interim Report" (PDF). Metallurgical Corporation of China Limited. archive of Hong Kong Stock Exchange. 24 August 2010. Retrieved 3 October 2016. ^ "DISCLOSEABLE TRANSACTION, CONNECTED TRANSACTION" (PDF). PetroChina. archive of Hong Kong Stock Exchange. 24 December 2016. Retrieved 3 October 2016. ^ "2015 Annual Report" (PDF). New China Life Insurance. archive of Hong Kong Stock Exchange. 17 April 2016. Retrieved 4 October 2016. ^ "2015 Annual Report" (PDF). 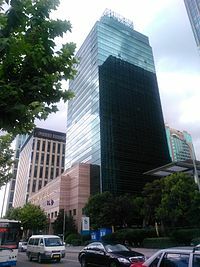 China Bohai Bank. 16 June 2016. Retrieved 17 October 2016. ^ "2015 Annual Report" (PDF). China Pacific Insurance. archive of Hong Kong Stock Exchange. 27 April 2016. Retrieved 20 October 2016. Wuhan Iron and Steel Co., Ltd. This page was last edited on 11 January 2019, at 09:56 (UTC).